Christmas in Cape May is almost here. And, we had a blowout holiday preview weekend with a wide variety of tours, food and events to celebrate the holiday season. On November 17th, Santa flipped the switch at the tree-lighting ceremony at the Physick Estate. Children enjoyed trolley rides with Santa while adults were entertained by the Ghosts of Christmas Past trolley ride. What’s next? The West Cape May Christmas Parada and MAC’s Candlelight House Tour! And, guess what? 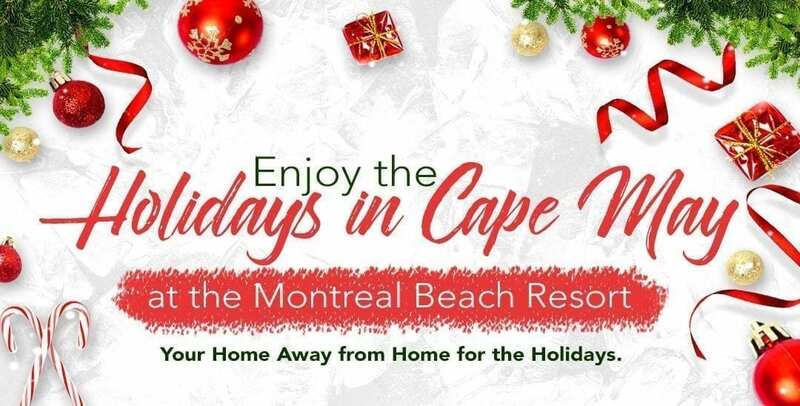 Our sister establishment, The Montreal Beach Resort, is celebrating these events with special package deals in honor of the Christmas spirit. The West Cape May Christmas Parade sets the stage for the areas holiday season. Now in its 53rd year, the parade begins at 5:00pm from the WCM Volunteer Firehouse and marches South on Broadway, winds East on Perry, and onto Carpenter Lane in the City of Cape May. A small army of volunteers assembles an unforgettable hometown memory each year. Join us for one of the most popular events of the season: The West Cape May Christmas Parade! Stay at the Montreal Beach Resort November 30 through December 2 and enjoy Cape May’s Christmas Parade as well as all other fun holiday activities planned throughout the city. Premium Accommodations starting at $157 per night*. Your choice of two tickets to one of the excellent holiday tours produced by Cape May’s Mid-Atlantic Center for the Arts & Humanities: The Holiday Lights Trolley Tour or the Physick Family Christmas Tour*. Visit the Montreal Beach Resort this holiday season to celebrate our Christmas in Cape May. We look forward to welcoming you back in the spring. Happy Holidays from Harry’s!